New River Gorge National River officials announced yesterday that the Trail Development Plan - Phase One/Environmental Assessment (plan/EA) is now available for public review and comment. The National Park Service proposes to develop new trails throughout areas of the northern half of the New River Gorge National River, from McCreery north to the park boundary on river left in accordance with decisions made in the park's approved General Management Plan. The plan/EA examines two alternatives. The NPS Preferred Alternative proposes developing trail segments of the Through Park Connector and outside links and implementing park protocols for current and future trail design and construction that would avoid and minimize adverse impacts to the park's natural and cultural resources. "Area residents, business owners, local officials, and organizational representatives are encouraged to review the plan, and comment on-line, by mail, or attend the Open House anytime between 4pm and 7pm and tell us what they think," said Acting Superintendent Debbie Darden. "The public has expressed a great deal of interest in developing additional trail opportunities for both hiking and bicycling within the park. We invite the public's continued participation in this planning process by providing written comments and by attending the Open House at Canyon Rim Visitor Center," said Darden. Open House: Thursday, March 21, 2013, anytime between 4-7pm, at the Canyon Rim Visitor Center, located off U.S. Route 19, just north of the New River Gorge Bridge. Please submit comments on-line or by mail no later than April 5, 2013. As the National Park Service moves closer to its second century, one of the key indicators of how parks are doing, and how the NPS is fulfilling its mission, is the economic impact that national parks have on America’s economy. According to a report compiled by Michigan State University, every dollar spent by the National Park Service, through Congressional appropriations, results in a $10 benefit to the national economy. Using data gathered from parks and public data, economists at Michigan State examined the impacts visitor spending has on the local economy in terms of sales, income, and jobs in a report published yesterday called Economic Benefits to Local Communities from National Park Visitation, 2011. The information contained in this report will be used for planning, concessions management, budget justifications, policy analysis, and marketing. According to the report, the National Park System received 278.9 million recreation visits in 2011, while park visitors spent $12.95 billion in local gateway regions (defined as within roughly 60 miles of a park). In total, park visitor spending supported 252,000 (mostly) local jobs. The four local economic sectors most directly affected by visitor spending are lodging, restaurants, retail trade, and recreation and entertainment. Spending from these sources supported 45,200 jobs in restaurants and bars, 34,100 jobs in lodging sectors, 15,500 jobs in the retail and wholesale trade, and 20,000 jobs in recreation and entertainment. Visitors staying overnight outside the park (in motels, hotels, cabins, and bed & breakfasts) accounted for 54.9% of the total spending. About half (48%) of the spending was for lodging and meals, 21.4% for gas and local transportation, 9.7% for recreation and entertainment, 8.1% for groceries, and 12.7% for other retail purchases. As a result of the Great Smoky Mountains being the most visited national park in the country, the park also had the greatest impact on the local economy when compared to any other park in the system. 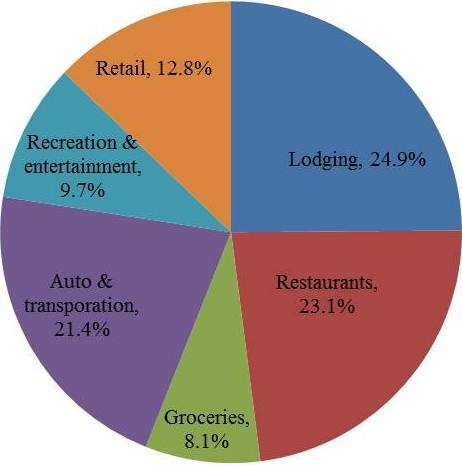 In 2011 visitors to the Smokies spent roughly $818,886,000 in the surrounding communities. This spending supported 11,418 jobs. As a comparison, visitors along the Blue Ridge Parkway spent roughly $340,085,000, which supported 4,379 jobs. You can view the entire NPS report by clicking here. Chronic wasting disease (CWD) is an infectious pathogen that has been detected in white-tailed deer populations within 22 miles of Shenandoah National Park. CWD impacts the deer’s neurological system and is eventually fatal. Park managers are already planning how they will address CWD should it infect the park’s deer population (you can click here for background information). The National Park Service is conducting a series of public meetings to present information and gather feedback to help inform its planning process. Attendees may also submit comments in writing on forms available at the meetings, online, or by mail, as described below. On February 13th Great Smoky Mountains National Park officials implemented the highly controversial backcountry camping fee plan. In response, the Blount County Commission passed a resolution condemning the fees during its meeting this past Thursday. The Commission is also asking the Tennessee General Assembly "to carefully investigate this matter and to join in formally opposing the imposition of the backcountry camping fee for the Great Smoky Mountains National Park". They're also asking the counties that surround the park to join in this resolution as well. BE IT FURTHER RESOLVED, that this Resolution shall take effect from and after its passage the public welfare requiring it. Duly authorized and approved on this 21st day of February, 2013. You can read all the reasons the Blount County Commissioners oppose the fees, as well as several supporting documents, by clicking on the February 21st meeting minutes document. This is an 805-page PDF document (12.75 mg). The portion concerning the fees begins on page 276. This past Thursday night seven Park Rangers and Volunteers were honored in Washington, DC for their outstanding service to the National Park Service. The seven received the 2012 Harry Yount National Park Ranger Award and the Hartzog Awards for Outstanding Volunteer Service. The National Park Service and the National Park Foundation presented Ranger Brandon Torres from the Grand Canyon with the 2012 Harry Yount National Park Ranger Award for excellence in the art of rangering. Named after the first known park ranger, the award is the agency’s most prestigious ranger honor. Among the six volunteers receiving Hartzog Awards was Robin Goddard from Great Smoky Mountains National Park. Goddard, who received the Hartzog Enduring Volunteer Service Award, was recognized as an excellent interpreter, teacher, storyteller, and trainer that has provided more than 12,000 hours of outstanding volunteer service over the last 43 years. "Robin has developed material for curriculum-based programs, taught countless outdoor classes, assisted scientists with collecting data, developed first person historical programs, and served as a formal Great Smoky Mountains Ambassador through outreach programs in the community. Because of Robin’s passion, knowledge, and professionalism, she often represents the park by conducting special programs for dignitaries, politicians, and other special park guests. She performs these duties while also faithfully conducting her weekly interpretive program for visitors April through October, rain or shine. Through her highly attended weekly program at Little Greenbrier Schoolhouse, Robin continually engages and educates the public, young and old alike, while also creating future park advocates." The Hartzog Awards are named for former National Park Service Director George B. Hartzog, Jr., who started the extremely successful Volunteers-In-Parks (VIP) Program in 1970. For more information on the awards and the other recipients, please click here. Yesterday I posted an article about Operation Something Bruin, an undercover wildlife poaching operation that has targeted about 80 wildlife violators, and some 980 violations over the last four years. The US Forest Service press release stated that the operation involved wildlife officials in North Carolina and Georgia. Today we learned from NPS Digest that the operation also took place in the Great Smoky Mountains, and may involve other states adjacent to NC and GA.
State and federal wildlife officials in North Carolina and Georgia have announced an undercover operation that involved about 80 wildlife violators and some 980 violations. Some of these offenses occurred within the park’s boundaries and the investigation may lead to the filing of federal charges in coming weeks. Primary violations documented by Operation Something Bruin stem from illegal bear hunting, but include an array of state wildlife and game law charges. The four-year investigation, the largest of its kind in recent years, targeted poachers in North Carolina and Georgia, with work in some adjacent states. Officers with the Georgia Department of Natural Resources and the North Carolina Wildlife Resources Commission infiltrated poaching circles to document violations, that included bear baiting, the illegal taking of bears, deer and other wildlife, the illegal use of dogs, the illegal operation of bear pens in North Carolina, and guiding hunts on national forest lands without the required permits. Participation in the operation were officers and rangers from the U.S. Forest Service, the U.S. Fish and Wildlife Service and the National Park Service. You can learn more about Operation Something Bruin by clicking here. State and federal wildlife officials in North Carolina and Georgia announced yesterday an undercover operation that involved about 80 wildlife violators and some 980 violations. Primary violations documented by Operation Something Bruin stem from illegal bear hunting but include an array of state wildlife and game law charges. Some suspects could also face federal charges. The four-year investigation, the largest of its kind in recent years, targeted poachers in North Carolina and Georgia, with work in some adjacent states. Officers began making arrests Tuesday, Feb. 19. Officers with the Georgia Department of Natural Resources and the North Carolina Wildlife Resources Commission infiltrated poaching circles to document violations including bear baiting; illegal take of bears, deer and other wildlife; illegal use of dogs; illegal operation of bear pens in North Carolina; and, guiding hunts on national forest lands without the required permits. Operation Something Bruin partners also included the U.S. Forest Service, the U.S. Fish and Wildlife Service and the National Park Service. For those who persist in wildlife theft, Something Bruin will help agencies better train officers to catch them – an effort strongly supported by hunters and anglers, our nation’s first conservationists. The National Park Service has released Bats in Crisis, three videos about white-nose syndrome, a disease that is decimating bat populations across eastern North America. The disease is found in 10 national parks. Its presence has just been confirmed in Cumberland Gap National Historical Park, and the National Park Service is concerned it will reach more parks. The Bats in Crisis videos feature National Park Service scientists, technicians, and educators and are online here. Cave park visitors can access the videos using “QR” codes affixed to signs, kiosks, brochures, and other media. White-nose syndrome is caused by a cold-adapted fungus, Geomyces destructans. The disease – which is not transmittable to humans – was first observed in caves near Albany, N.Y., in the winter of 2006–2007. Since then, white-nose syndrome has spread to 18 more states and four Canadian provinces. It has been detected in seven species of hibernating bats, and G. destructans has been found on two additional species, apparently without causing white-nose syndrome. The 10 national parks that have reported bats with white-nose syndrome are: Acadia National Park (Maine), Chesapeake and Ohio Canal National Historic Park (Washington, D.C, Md., W.Va.), Chickamauga and Chattanooga National Military Park (Ga. Tenn.), Cumberland Gap National Historical Park (Ky., Tenn., Va.), Delaware Water Gap National Recreation Area (N.J., Pa.), Great Smoky Mountains National Park (N.C., Tenn.), Mammoth Cave National Park (Ky.), New River Gorge National River (W.Va.), Ozark National Scenic Riverways (Mo. ), and Russell Cave National Monument (Ala.). National parks across the country have implemented management and educational activities to help minimize the spread of the disease and work collaboratively with federal, state, tribal, and private groups to improve understanding of the disease. For more information about white-nose syndrome in the National Park Service, visit: www.nature.nps.gov/biology/WNS/index.cfm. For more information about white-nose syndrome in general visit: www.whitenosesyndrome.org. Right Place Right Time...... from Aaron Morrell on Vimeo. The latest dire warnings from politicians, news media outlets, pundits and special interest groups are currently focused on an inside-the-beltway term known as sequestration. Sequestration refers to the across-the-board budget cuts that will take effect on March 1st - unless an agreement on deficit reduction can be reached beforehand. This "gimmick" was agreed upon by both the president and congress several months ago in order to force both sides to come to some agreement on spending reductions. This blog posting will focus on the impact sequestration will have on national parks. Most importantly, it will focus on a leaked memo from National Park Service Director Jon Jarvis, which makes very little sense from my perch. Late last month the Coalition of National Park Service Retirees published a leaked memo from National Park Service Director Jon Jarvis, which stated that the NPS should assume a 5% decrease in the 2013 budget as a result of the impending sequestration. I find this figure to be a little curious. 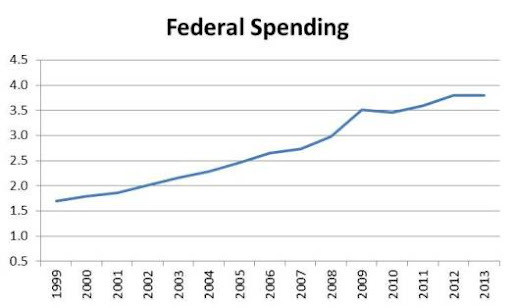 The sequestration calls for a cut of $85 billion to the 2013 federal budget, which amounts to only a 2.24% decrease in the overall federal budget. Moreover, according to an analysis by the Congressional Budget Office, only $44 billion would actually be cut out of the 2013 budget. This is due to the sequestration taking effect on March 1st, which is already 5 months into the federal fiscal year which began on October 1st. This means only 1.16% of the 2013 budget is scheduled to be cut if sequestration goes into effect. So why is Jarvis stating that 5% needs to be cut from the NPS budget? 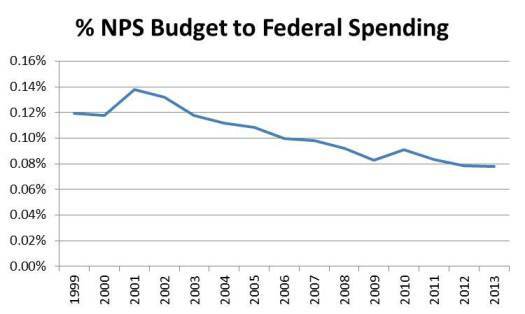 Or, why would the president decide to cut NPS funding at a higher rate than the rest of the budget? A budget cut of 1.16% would reduce the National Park Service budget from $2.97 billion, down to $2.94 billion. 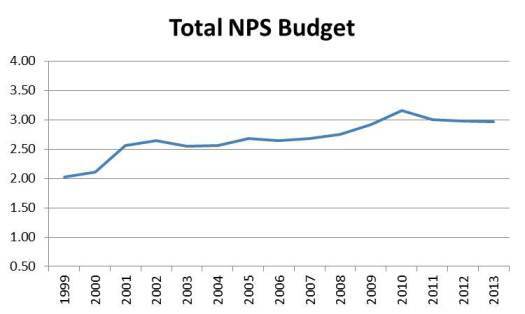 A cut of 2.24% would reduce the NPS budget down to $2.90 billion. Even if we were to assume that the NPS Director is correct (which I don't), a cut of 5% would draw the NPS budget down to $2.82 billion - which is still higher than the amount that the NPS spent in 2008, or any year before that. So when I see headlines from the Coalition of National Park Service Retirees that reads "Sequestration Budget Cuts Would Turn National Parks Into Ghost Towns", or from the National Parks Conservation Association; "Proof Positive: Our National Parks Are in Peril", I can't help but be a little skeptical. Then, when I read things like "all national parks should be prepared for reduced hours and fewer services", or "NPS said cuts could include closing of campgrounds and hiking trails. Interpretive programs could also be curtailed" or "If these cuts go into effect, it appears they will harm every one of the 398 parks and monuments in the system as well as park rangers, tourism-dependent businesses and communities, and the millions of Americans who rely on national parks for affordable vacations", I can't help but conclude that these organizations and news media outlets are simply using scare tactics to get cash-strapped Americans to pony up more tax dollars. I'm calling BS on all this. Certainly there are many smart people in NPS management that can figure how to operate off the same amount of money they were receiving just a couple of years ago. And, for that matter, the same goes for all the other agencies and programs in Washington DC, whose special interest groups are likely using the same scare tactics. Outdoor recreationalists can now experience the new National Water Trails System through a brand new interactive website that connects users to rivers and waterways through stories and tools. Secretary of the Interior Ken Salazar announced the new National Water Trails System in February 2012, with the objective of creating a national network of exemplary water trails that are cooperatively supported and sustained. 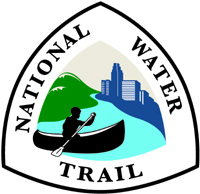 Nine National Water Trails have been designated across the United States. The Rivers, Trails and Conservation Assistance program and the Denver Service Center are continuing work on "Call to Action" item 12, "Follow the Flow," by partnering to develop the new website, which will improve communication with current and potential water trail managers and with recreational trail users. Water trail managers can apply for designation through an easy online application, and visitors can learn more about designated trails through a photo gallery, dynamic stories, and videos. An interactive map and new search functions make it easy for users to find national water trails throughout the country. You can visit the new website at www.nps.gov/watertrails. Friends of the Smokies monthly NC Classic Hikes of the Smokies, led by Danny Bernstein, will be held on the 3rd Tuesday of every month beginning in March. In honor of Friends of the Smokies' 20th Anniversary, each hike will highlight a project made possible through funding from Friends - license plate purchases, special events attendees, GSMNP donation box contributors, business and foundation support, and donations from groups and individual Smokies lovers far and wide. The first hike will be on Tuesday, March 19th: Cataloochee up Davidson Gap. The hike is 8 miles roundtrip, with 1600 feet of climbing. Hikers will start at Nellie in Cataloochee valley and will hike up through Davidson Gap, which divides Little and Big Cataloochee valleys. In honor of Friends of the Smokies 20th Anniversary hikers will visit the Dan Cook Cabin, which was restored with the help of Friends, followed by the Little Cataloochee Church, and the return trip to Nellie. To register, please contact Friends’ Waynesville, NC office at (828) 452-0720 or email Keith Hoffman, the AmeriCorps Outreach Associate at outreach.nc@friendsofthesmokies.org. As part of a program to use "managed fire" inside the park, Cumberland Gap National Historical Park will be burning 286 acres near Tiprell, Tennessee in mid to late February. The goal is to reduce hazardous fuels near the town, and also to help maintain the type of historic forest found by Daniel Boone and Thomas Walker when they first arrived in the area. "Managed fire," explained Chief Ranger Dirk Wiley, "is just another tool to help protect the park and our neighbors. It lets us burn a little, under very controlled conditions, so that we prevent a larger fire from threatening the park and nearby homes." It sounds simple, but involves a complicated "prescription" that accounts for wind, fuel moisture, slope and sunshine, the spread of the smoke, and the effect of the fire on the existing plants. By carefully lighting the understory, the goal is to reduce the small fuels that can build up and create uncontrollable wildfires during dry periods. It also has the benefit of maintaining a forest that developed over thousands of years of fires set by Native Americans as part of their own desire to improve hunting. The Tiprell fire will cover most of the hillside between Tiprell and the top of the ridge separating the park and Lincoln Memorial University. If all goes as planned, it will be done in one long day and the final result will be a subtle, but significant, reduction in both the fuels that carry fire and certain species of trees such as striped maple. Park Ranger Shane Sturgill, "burn boss" for the fire, details that a successful prescribed fire will be almost invisible just a few months after the actual fire is gone. "It's not a raging fire," said Sturgill. "It's the kind of creeping ground fire that passes through the forest naturally." The park will be notifying neighbors and nearby agencies on the day of the burn, and wants to make certain that nobody is alarmed by a sudden column of smoke inside the park. "It's just another day in the park," said Sturgill. "We're using fire as a tool to take care of the resources, the visitors, and our park neighbors." The park encourages anyone with questions to contact Chief Ranger Dirk Wiley at (606) 246-1054, or email dirk_wiley@nps.gov. Mammoth Cave, the longest known cave in the world, is now a little bit longer. On Friday, at the Mammoth Cave Science Symposium, Park Superintendent Sarah Craighead and Cave Research Foundation President Charles Fox announced that Mammoth Cave is now 400 miles long, up 10 miles from its previously recorded length of 390 miles. The National Park Service manages Mammoth Cave and 52,830 acres above it in south central Kentucky. Members of the Cave Research Foundation volunteer to explore, survey, and map the cave under a general agreement with the Park. Discovery and mapping of the cave allows that Park to better manage and protect its geological and biological underground resources. "The Cave Research Foundation has been a key partner with Mammoth Cave since 1956, sharing our commitment to cave and karst stewardship," said Craighead. "Their volunteers make things happen that otherwise would not be possible." "The expansion of the Mammoth Cave system in the last few years has been a matter of incremental additions to many parts of the cave rather than a single major discovery that pushed the cave past 400 miles," said Fox. "In recent years we have resurveyed sections of the cave so that we can produce more detailed maps that meet modern mapping standards, as well as exploring and mapping previously unexplored passages. We have been able to reach this milestone because of the cooperative work of the Cave Research Foundation, the National Park Service, and also the Central Kentucky Karst Coalition working in a section of Mammoth Cave that lies outside the Park boundary." The Cave Research Foundation has operations in multiple areas, one of which is Mammoth Cave National Park, with a major focus on cave exploration and cartography. However, the group's volunteers also assist with projects involving restoration, cave gate installation, inventory and monitoring of cave resources, and logistical support for scientific research. In 2012, the Cave Research Foundation contributed 10,669 volunteer hours to Mammoth Cave National Park, a value of more than $230,000. Earlier in the week the N.C Division of Parks and Recreation announced that visitation at North Carolina’s state parks and state recreation areas continued at a record level in 2012, with 14.2 million visits, matching attendance levels set in 2009 and 2011. Among 41 state parks and state recreation areas, 18 reported increases in attendance in 2012. Fort Macon State Park in Carteret County reported the highest attendance at 1.24 million visits, down slightly from 1.29 million last year. A 2008 economic study revealed that travelers spend an average $23.56 a day to enjoy the state parks. The analysis by North Carolina State University’s Department of Parks, Recreation and Tourism Management estimated the state parks system’s total annual economic impact at more than $400 million. The complete study can be found here. During the past 25 years, the state parks system has seen a dramatic 87 percent increase in visitation. In 1987, 7.6 million people visited state parks and state recreation areas. Several state parks that reported higher attendance in 2012 were able to offer improvements and new amenities to visitors. A new 7,100-square-foot visitor center and related facilities were dedicated at Gorges State Park, and the park experienced a 22 percent increase in visitation. 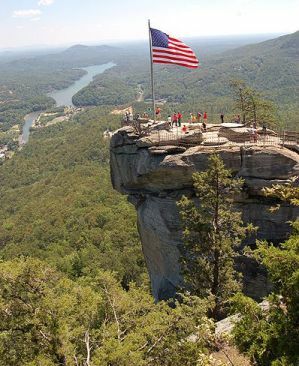 Improvements in access facilities at Chimney Rock State Park contributed to a 36 percent jump in attendance, while William B. Umstead State Park in Wake County, which improved parking and a popular trailhead area, recorded visitation up 33 percent. Other parks with significant increases in visitation include Hammocks Beach State Park in Onslow County (57 percent), Haw River State Park in Guilford and Rockingham counties (31 percent), Jordan Lake State Recreation Area in Chatham County (35 percent) and Lake Waccamaw State Park in Columbus County (53 percent). The state parks system manages more than 217,000 acres within state parks, state recreation areas and a system of state natural areas dedicated to conservation of rare resources. Through its New Parks for a New Century initiative, six new state parks have been added to the system since 2003. This week the Southern Appalachian Highlands Conservancy announced the recent purchase of a 601-acre tract of land that will protect areas adjacent to Grassy Ridge on Roan Mountain. At the very end of December 2012, SAHC purchased the tract at Grassy Ridge in Avery County, NC, adjacent to the Pisgah National Forest and near the Appalachian Trail. This incredible tract borders one of the highest ridges of the Southern Appalachians, and has been one of SAHC’s top conservation priorities for four decades - due to its size and location within a large network of high elevation protected lands. At its northern boundary, the tract takes in the crest of Grassy Ridge where it joins Pisgah National Forest, and at the southern end the property joins a tract owned by the State of NC in the Yellow Mountain State Natural Area. This newly protected Grassy Ridge tract consists of a large, forested bowl within three ridges: Grassy Ridge, Big Roan Ridge, and Martin Ridge. It lies in the view shed of the Appalachian Trail, the Overmountain Victory Trail, and other locations in the Highlands of Roan. SAHC's purchase of the tract permanently protects pristine water quality and globally significant plant & animal habitat, and will enable biological research, contributing to large-scale management of the core Roan landscape. One of the largest concentrations of rare species and communities in the state are found on Grassy Ridge and the adjoining habitats of Roan. The Roan Mountain Important Bird Area and the Roan Massif Significant Natural Heritage Area cover the property, and hundreds of acres of high elevation old fields form a wonderful swath of bird habitat, prime for Golden-winged warblers. Headwater tributaries of Roaring Creek originate on the tract – wild trout waters that flow into the North Toe River. For more information on the purchase, please click here. The hike out to Grassy Ridge, along the Appalachian Trail, is one of my favorite hikes in the entire Southern Appalachians region. If you've never had the pleasure of hiking it, I highly recommend spending a half day soaking in the incredibly beautiful views. For more information about the hike, please click here. The U.S. Forest Service National Forests in North Carolina today announced that all six district public meetings are now scheduled as part of the Nantahala-Pisgah National Forests management plan (the Plan) revision. This is the first complete set of public meetings that the Forest Service will conduct under the first phase of Plan revision. The meetings will provide an overview of the planning process, as well as an opportunity for sharing information about these two national forests. The U.S. Forest Service is in the process of revising the management plan for the Nantahala and Pisgah National Forests. Collaboration with the public is a vital part of the process. When completed, the plan will guide management of the two national forests for approximately 15 years. Help plan the Forests’ future. You can visit www.fs.usda.gov/nfsnc to sign up to receive Forest Service News Alerts. Visit www.fs.usda.gov/goto/nfsnc/nprevision for more information on Plan revision. Great Smoky Mountains National Park announced today that Clingmans Dome Road, a popular high elevation visitor destination, will open to traffic as weather conditions allow as early as February 15. The road will continue to be monitored for hazardous conditions throughout the remainder of the winter season, and will still be subject to closure pending inclement weather. This means hikes along the Spruce-fir Trail, the upper Sugarland Mountain Trail, and out to Andrews Bald will now be accessible. Winter weather, especially at high elevations, is often unpredictable, which is why the Park typically closes the road from December 1 through March 31 of each year. 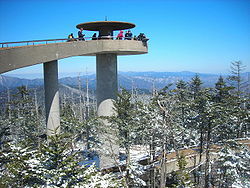 Milder temperatures over this season have allowed for better access to the road for visitors wanting to reach the popular park destination of Clingmans Dome, the highest point accessible by vehicle. The road will not be plowed, though, if snow or ice develops. It will instead be closed so visitors may utilize the area for winter recreation, such as cross country skiing or snowshoeing. 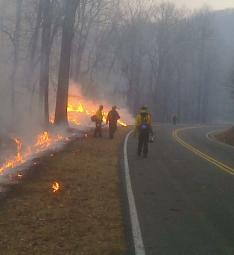 For the most current road closure information, please call 865-436-1200 x 631 or follow SmokiesRoadsNPS on Twitter. Registration opened today for the 63rd Annual Spring Wildflower Pilgrimage. The four-day event offers 141 professionally guided walks and indoor presentations which explore the region’s rich wildflowers, fauna, ecology, cultural and natural history. There will be a variety of wildflower, fauna and natural history walks, motorcades, photographic tours, art classes, and indoor seminars. Most programs are conducted on the trails in Great Smoky Mountains National Park, while indoor offerings are held in the Mills Conference Center and the Sugarlands Training Room in Gatlinburg, Tennessee. All programs will be held rain or shine. The event website and brochure provide descriptions of all pilgrimage programs which are listed by date and time. Each description includes starting points, walking distances, hiking difficulties, and registration limits. Popular programs are repeated at different times and days and are referenced under “similar programs.” There’s also an alphabetical index of all program topics and destinations on page 19 of the brochure. Programs meeting at trailheads or other sites in the park require participants to arrange their own transportation. Vans will be provided where trailhead parking is limited. Participants are strongly encouraged to use the free van service. On-site registration will begin Tuesday, April 23, 2013 at 5:00 PM in the Mills Conference Center in Gatlinburg. In a press release published earlier in the week, the N.C. Wildlife Resources Commission announced that it was joining other agencies and organizations in support of the controversial plan to use prescribed fire in the Linville Gorge Wilderness Area and adjacent National Forest System lands. The Wildlife Commission stated that it supports a proposal the U.S Forest Service is considering to use prescribed fire on nearly 16,000 acres in and near the Linville Gorge Wilderness Area on the Grandfather Ranger District. The Wildlife Commission said that prescribed fire would greatly reduce the risk of catastrophic wildfires, such as those that occurred in 2007, and help restore the fire-adapted ecosystem of the area. They note that prescribed fire will be particularly beneficial to fire-adapted plant species such as the rare Mountain Golden Heather that are at risk of disappearing due to decades of fire suppression. Wildlife species will also benefit from the controlled ignitions and less intense heat of a prescribed fire, as opposed to wildfires, which burn at a much higher intensity and have potential for large-scale spreading to adjacent private lands. The Wildlife Commission points out that using prescribed fire outside of the growing season will also promote and maintain a thick understory of berry-producing plants and grasses that provide key habitat and forage for wildlife. Critical mountain pine and oak habitats that need periodic low-intensity fires to maintain and promote regeneration, will also be favored through the use of prescribed fire, helping to restore the fire-adapted ecosystem native to this landscape. Past wildfires that have occurred in parts of this wilderness area have burned at high intensities during growing seasons, harming the forests, sterilizing soils, and providing areas for non-native invasive plants to establish. 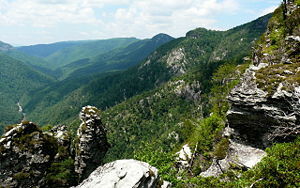 For more information on hiking in the Linville Gorge, please click here. The U.S. Forest Service National Forests in North Carolina today unveiled the Nantahala and Pisgah National Forests Non-motorized Trail Strategy report. The report is available online at: www.fs.usda.gov/goto/nctrailstrategy. The report provides information on trail complexes in the Nantahala and Pisgah National Forests, and summarizes recommendations from stakeholders. The report includes comments from each ranger district on recommendations from the public. Additionally, the report identifies sources of funding, such as grants, which could be used to help maintain trails. While no decisions on specific trails are being made at this time, the report will serve as a guide for future trail management in the two national forests. The report will be helpful in formulating desired conditions for trail management in the Nantahala and Pisgah National Forests management plan, which is in the process of being revised. The Trail Strategy process began in 2010 with Forest Service personnel updating the agency’s database of non-motorized NFsNC trails by verifying location and condition of the existing trail system. In 2012, the Forest Service held multiple public meetings in all six districts of the Nantahala and Pisgah national forests. During the public meetings, trail enthusiasts and others with knowledge of non-motorized trails in North Carolina had a chance to provide input in the transparent and inclusive process. Organizations that promote nature-based tourism also played a role in development of the Non-motorized Trail Strategy. During working meetings, collaborators shared the types of trail experiences they enjoy. They also looked at larger landscape and recreation issues to see how existing trails fit on national forest and non-forest lands. Partners explored connectivity of the national forest trail system with surrounding communities, county greenways, and other federal, state and local trail systems. Also, recommendations were provided on volunteer recruitment, training and project management. The Nantahala and Pisgah national forests have close to 1,600 miles of non-motorized trails. Millions of people visit the two national forests every year. The U.S. Forest Service National Forests in North Carolina has announced the dates and locations of the last two meetings held as part of the Non-motorized Trail Strategy initiative for the Nantahala and Pisgah National Forests. Great Smoky Mountains National Park and the Eastern Band of Cherokee Indians (EBCI) have partnered together to offer an early completion incentive for repairs to Newfound Gap Road (US 441) which was closed due to a January landslide. An extended road closure has significant economic implications for the surrounding tourism-based gateway communities. Park officials and the EBCI worked together to offer a monetary incentive of $18,000 per day to the selected contractor for each day of completion prior to May 15, 2013, up to a maximum of $500,000. The amount donated by the EBCI will apply to the first 14 days of the incentive period at the above rate. EBCI Principal Chief, Michell Hicks, and Park Superintendent, Dale Ditmanson, recognize the importance of Newfound Gap Road as a vital economic artery linking the NC and TN communities, as well as its importance to park visitors who enjoy the unique driving experience. In addition to the monetary incentives, the contract also includes monetary disincentives. The contractor will be charged $18,000 per day past May 15, 2013 to help insure the project is completed on schedule. The contracting piece for phase 2, involving the actual road reconstruction, was initiated on Friday January 25, when Federal Highways Administration (FHWA) posted a pre-solicitation for contractors with interest in repairing the landslide. Through this process a number of successful contractors submitted acceptable technical proposals and are now eligible to submit a bid to for the project. Bids from these contractors are due February 15, 2013. The contract for this phase of work is estimated to cost between $3,000,000 and $7,000,000. Final construction work will begin soon after. Phase 1 of the reconstruction project is on schedule. Phase 1 contract crews from APAC -Atlantic Harrison are in the process of building the haul road, stabilizing the site, and removing debris to prepare the site for Phase 2 reconstruction. Soil erosion mitigation efforts to stabilize the debris field and minimize siltation into Beech Flats Prong stream have been completed. In addition, park biologists have completed all environmental compliance associated with the road reconstruction. Newfound Gap Road will remain closed to thru traffic during the construction, but visitors are still able to access the park to Newfound Gap from the TN side and to Collins Creek Picnic Area from the Cherokee, NC entrance. Great Smoky Mountains National Park suffered significant damage to park roads and trails following a flood event two weeks ago, resulting in the temporary closure of sections of gravel roads within several popular areas. Closed areas include Greenbrier Road past the Greenbrier Ranger Station, Cataloochee Road past Palmer Chapel, and Parson's Branch Road. During the rain event on January 30th, the park received over 4 inches of rain in 24 hours resulting in flooding of streams throughout the park which were already swollen from higher than normal precipitation throughout January. Average rainfall during January across the park averages 5-7 inches of rain, but the park received 14-17 inches of rain this January. The gravel roads in Greenbrier, Cataloochee, and Parson's Branch were washed out exposing underlying rock and culverts. Park crews are assessing the damage and estimate that repairs will be completed by the end of March. In addition to replacing culverts, roads will need to be graveled and re-graded. 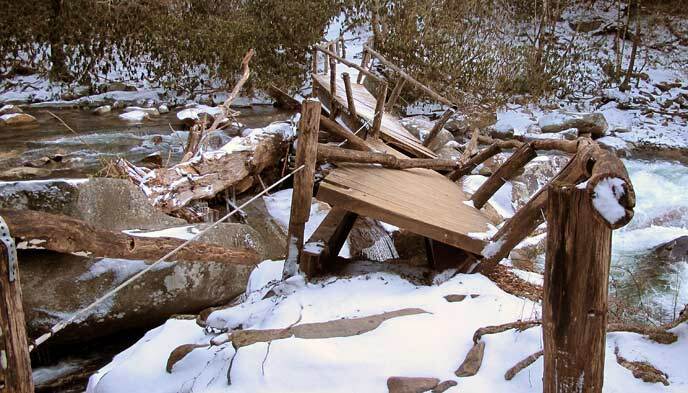 High waters also destroyed the pedestrian bridge across Walker Camp Prong along the popular Chimney Tops Trail. The 70-foot long pedestrian bridge, originally built in the late 1950s, will have to be entirely replaced to allow trail access. Trail crews are assessing bridge replacement options and do not yet have a date estimate for completion. For more information about road closures, please visit the Roads and Facilities Closures page or call the park's Road and Weather Information Line at 865-436-1200. On January 31st, Great Smoky Mountains National Park visitors reported the defacement of natural stone features and masonry stone walls at the Sinks. The Sinks is a popular roadside waterfall located on Little River Road between Metcalf Bottoms Picnic Area and the Townsend Wye. Vandals spray painted pictures and profanity along the walkways, stone walls, and natural rock throughout the area. "This was not a minor act of tagging by someone with a can of spray paint," said Chief Ranger Clay Jordan. "The amount of damage maliciously caused to this beautiful setting is disheartening." As such, Jordan announced that the Park is offering a $1,000 reward for information leading to the arrest and conviction of the individuals responsible for this vandalism. Rangers report that the graffiti includes references to "Wolfgang" and "Lumberjack". In 2010, the Park renovated the Sinks parking area including the construction of new stone masonry retaining walls, cut-stone walkways, and a new overlook area with a masonry wall and handrail so that all visitors, including the disabled, are able to safely view the waterfall and rapids. The Sinks is a popular destination for visitors throughout the year who stop to view the 15-foot cascade. Park employees spent several hours removing the offensive language and images using a variety of techniques to remove the paint without causing further resource damage. It is unlawful to disturb or deface natural and historic resources within the Park. Perpetrators may be sentenced up to 6 months in jail and or fined up to $5,000. Anyone with information as to the possible identity of the vandals is encouraged to call the tip hotline at 865-436-1580. The Daniel Boone National Forest has announced a proposed change to the winter use fee at the Koomer Ridge Campground in the Red River Gorge. The proposed change would increase the nightly fee to $10.00 from November to mid-April. The current rate is $7.00 per night. The proposed change would take effect beginning in November of 2013. Interagency Senior and Access Passes will continue to be honored. From mid-April to November, Koomer Ridge is operated by Thousand Trails concession. During this season fees are set by the concessionaire. For additional information, or to make a comment concerning the new proposal, contact the Cumberland Ranger District at 606-663-8100. Forest Supervisor Kristin Bail with the National Forests in North Carolina today announced that the agency plans to restore between 8,000 and 10,000 acres of the Nantahala and Pisgah National Forests in 2013 using prescribed burning. By using low- to medium-intensity prescribed burns, Forest Service employees plan to reduce overgrown vegetation and woody debris that could cause high-intensity wildfires that threaten lives, homes and public infrastructure. Catastrophic wildfires degrade forest health by scorching soils and killing many mature trees and other desirable plant species. Prescribed burning will result in healthier forests that are less congested, more biologically diverse and more resilient to threats from invasive plants and pests, such as southern pine beetle. All prescribed burns are completed by trained wildand fire professionals in accordance with detailed plans, which include desired weather conditions and other strict safety parameters, as well as modeling to reduce the effects of smoke. Scientists have found that fire has been a part of western North Carolina’s forests for at least 4,000 years and possibly up to 12,000 years. Lightning strikes ignited many fires, and Native Americans introduced prescribed burning to clear land and for regeneration purposes. European settlers continued the practice. These frequent, low-intensity fires shaped healthy forests in western North Carolina. The USFS did not provide any information with regards to exact locations or timing concerning the burns. For more information on prescribed burning in the Nantahala and Pisgah national forests, please click here. REI in Asheville will be hosting a presentation on February 28th by Friends of the Smokies on hiking in the Great Smoky Mountains National Park. 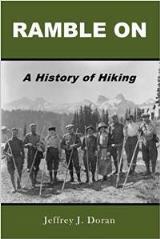 Friends hiking guide and author Danny Bernstein will share her experiences hiking in the Smokies and review reading a Smokies map, including information about entrances (in addition to Hwy 441) and facilities. There will also be a day-hike equipment demonstration by Gracia Slater, who has hiked all the trails in the Smokies - without any camping! Updates on the Smokies Trails Forever program will also be shared. Friends of the Smokies monthly Classic Hikes of the Smokies, lead by Danny Bernstein, will be on the third Tuesday of every month beginning in March. For details please click here. Attendees are asked to bring a map of the Great Smoky Mountains National Park - the National Geographic Trails Illustrated whole park version preferred. Friends will have some to give out though. Registration is required for this presentation. The U.S. Forest Service today announced that several roads on the Tusquitee Ranger District in the Nantahala National Forest remain closed because of mudslides caused by heavy rains in recent weeks. * FSR 440 (Big Tuni Creek Rd. ): Closed on the south end at the end of State Road #1311 and on the north end closed approximately 0.1 mile south of the Cherokee/Macon County line. * FSR 423 (Tatham Gap Rd. ): Closed at Milepost 1.0 from the junction of State Road #1391. Forest Service engineers are assessing the damage and working with the Federal Highways Administration to determine if emergency funding will be made available to repair the roads. Until a final determination is made on the safety and stability of the roads, emergency closures will remain in effect. The public is encouraged to contact the Cheoah ranger office at 828-479-6431 or the Tusquitee ranger office at 828-837-5152 for more information. Also, visitors can check the National Forests in North Carolina website, www.fs.usda.gov/nfsnc, for the latest information on road closures prior to traveling on Forest Service roads in the area. Do cell phones and internet Wi-Fi belong in national parks? Apparently the National Park Service thinks so. 1) Provide a basic level of non-fee internet access at all major, developed visitor areas in the national park system. 2) Provide basic cell phone service at all major visitor areas in national park units, as well as along most roads and at major sites such as trailheads. 3) Deliver timely, park-focused information within national parks through smart phones, tablets and computers. 4) Give individual parks discretion on where cell phone service is available, and whether the service provides full or emergency-only service. 5) Identify and employ best available and practical technologies that minimize visual impacts of cell and internet access systems. 6) Create special gateway zones at park entry points using downloadable data to replace both low-power radio systems and printed material hand-outs. 7) Design a system that is financially sustainable, generating revenues adequate to install, maintain and upgrade internet access. To do this, concessioners are offered the opportunity to develop and operate these systems, either individually or through a collaborative venture with other concessioners. 8) Offer additional bandwidth where possible to park visitors on a fee basis. 9) Coordinate efforts of the NPS, concessioners and friends organizations to create official park apps which can be readily downloaded to all major mobile channels, and which work to aid park visits, even when not connected to the internet, through GPS and other technologies. Deputy Director O’Dell delivered the recommendations to the NPS Regional Directors and assigned John Wessels (NPS Intermountain Regional Director) and Sue Waldron (NPS Assistant Director for Communications and lead for the NPS “Go Digital” component of A Call to Action) to work with NPHA. The list is now being reviewed by the regional and park teams and final selections of five (maybe more!) sites will occur early in January. A strategy session in February involving NPS, NPHA and communications firms is likely. Opponents of the connective service argue that intrusive technology goes against the idea of parks being a refuge from modernity. That it interferes with solitude. A press release from the Public Employees for Environmental Responsibility even stated that the plan was "a giant step toward ‘Disney-fying’ park interpretation..."
There is also the concern of distracted drivers on national park roads. There are reports of wildlife being killed as a result of drivers texting and talking on cell phones in some of the larger parks. Then there's the argument that outdoor adventurers have, and will continue to abuse the increased connectivity to call for unneeded rescue efforts. There's a sense that some people are more willing to engage in reckless behavior, knowing that there's a safety net of emergency responders just a phone call away. What are your thoughts? Do cell phones belong in the wilderness? Are Wi-Fi hot spots important to have in certain areas, such as near visitor centers? If you've reached a scenic overlook, or the top of a mountain after a tough hike, would you feel that some of the wilderness experience has been degraded if several people around you are talking on cell phones? The Conservation Trust for North Carolina announced yesterday that they have recently purchased a property that contains an important portion of the Overmountain Victory National Historic Trail (OVT) near Spruce Pine and the Orchard at Altapass, and which is highly visible from the Blue Ridge Parkway. The 128-acre property in McDowell County is located at the Heffner Gap Overlook (Parkway milepost 326) and is visible from both the Heffner Gap and Bear Den overlooks. The tract lies between two other properties that CTNC previously protected: the 1,488-acre CSX conservation easement and the 534-acre Rose Creek/OVT Natural Area, which is now managed by the North Carolina Wildlife Resources Commission as a state game land. The tract contains a short but critical section of the OVT that links nearly 1.6 miles of the Trail on the CSX easement with a 1.3-mile section on the Rose Creek property. The OVT traces the route taken by colonial militia to the pivotal battle of Kings Mountain during the American Revolution. CTNC purchased the property on December 21, 2012 for $700,000 from John & Anna Watson of Atlanta, GA with a $544,000 grant from the NC Department of Transportation’s Scenic Byways Program as well as funds from the NC Environmental Enhancement Grants Program and Fred & Alice Stanback of Salisbury. CTNC anticipates transferring the property to the National Park Service to be incorporated within the official boundaries of the Blue Ridge Parkway unit and dedicated as an official section of the NPS Overmountain Victory National Historic Trail. The OVT will soon be open on the Heffner Gap tract.